What is a dog behaviorist in Los Angeles? in Los Angeles or anywhere else? Many people ask, “What is a Dog Behaviorist?” because they may think that a dog trainer is a dog behaviorist, and that is not the case. This article explains it. What are the differences between a dog behaviorist, a dog behavior consultant, a dog trainer, and a licensed dog trainer? A dog behaviorist technically is someone who has a degree in animal behavior and specializes in dog behavior or is a Veterinary Behaviorist who has gone to veterinary school and has a veterinary degree with a specialty in behavior — there are only about 50 in the world!!! So technically, dog trainers cannot call themselves dog behaviorists unless they do, indeed, have a degree in animal behavior or are board certified veterinary behaviorists. But some dog trainers have other certifications. And, by the way, there is no “licensed” dog trainer in California. Any person advertising himself as being a “licensed” trainer may have a business license, but that’s about all. if they have had to pass examinations by an independent examining body other than where they attended school to get those certifications or degrees. She is the first dog trainer/behavior consultant worldwide to concurrently hold the these certifications. Read more about her background, training, qualifications and experience. 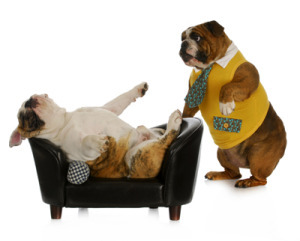 Now, let’s talk about dog behavior problems and how Doggie Manners can help YOU. If you are in the Los Angeles area, we can meet in person. ( Our primary areas of service are Santa Monica, Beverly Hills, Culver City, West Hollywood, Encino, and Sherman Oaks, but we travel to other areas such as South Bay and the rest of the San Fernando Valley), We also do telephone consultations. Please email us so we may contact you to talk about how we can work together to help you and your dog. Most dog behavior problems occur in the home and are the result of a miscommunication between a dog and its owner — what you intend and how your dog interprets what you do may be two entirely different things — or incomplete or ineffective training. Many problems can easily be solved when you understand how and why your dog acts the way he does. As we work together, we assess the cause of the problem and give you practical, clear-cut solutions which bring about positive changes. Unfortunately, there is no “one size fits all” in behavior modification and problem solving. So we work with each dog and owner individually and personalize a program to accomplish your goals, and we work with you every step of the way. We work on solving your dog’s issues and also offer a Basic Obedience Program which is a foundation program so you and your dog can communicate effectively. Some problems disappear with Basic Obedience, and no further lessons are necessary — other solutions are easier than you think! However, for those that need further training and guidance, there may be additional lessons. Jumping on people, furniture, etc. We specialize in puppies and small dogs! Please refer to Problem Solving Strategies for more information, and then email us or call (310) 804-2392. We look forward to working with you! Thank you for reading What is a Dog Behaviorist in Los Angeles?